A microwave is easily hung in just a few steps. 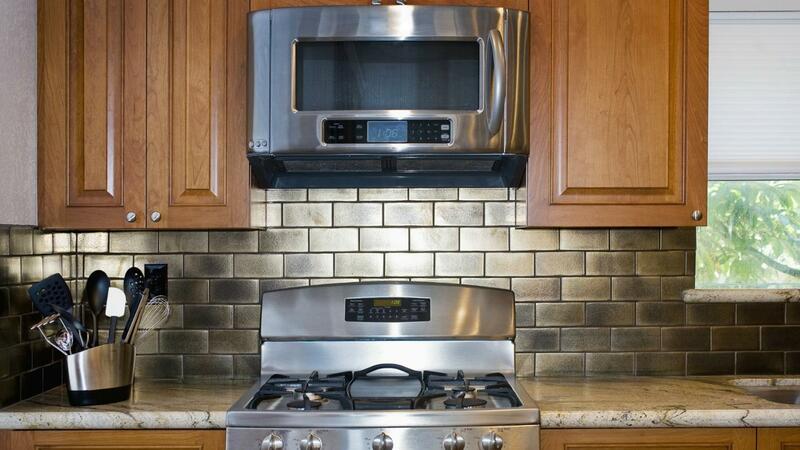 The most common way to hang a microwave is over the range. This describes the appliance when it is installed above the stove to act as a range hood providing light and a ventilation system. Using a stud finder, find the wall studs located over the stove where the microwave will be hung. The space needed must be no fewer than 30 inches wide. Next, draw a vertical line straight down the center of the space. A mounting plate should be placed against the wall with the top tabs touching the cabinet above, lining up the center notches with the vertical line drawn in previous step. Mark where the screws go into the mounting plate and drill holes in the marks using a drill bit. This needs to be done without the mounting plate up. Return the mounting plate to the wall and screw it into place with screws in the pre-drilled holes. Mark out the top of the microwave with a piece of poster board to create a template to mark out the holes needed on the underside of the cabinet. After marking needed holes on the underside of the cabinet, use the drill bits again to pre-drill holes. After lifting the microwave onto the bracket and securing it onto the tabs with the help of another person, drill screws into the pre-drilled holes and plug in the power cord. How Much Harmful Radiation Leaks Out of a Microwave Oven? How Do You Repair a Microwave Turntable? What Parts Can Be Replaced on an Emerson Microwave?